Our Geami eco packaging dispenser is portable and easily operated, with no need for electricity. 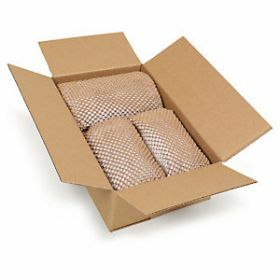 It works by simply converting die-cut white or brown wrapping paper into a 3-D honeycomb structure, forming an extremely effective shock-absorbent paper “bubble wrap”. This is dispensed on demand, complete with scratch-resistant white or black tissue paper interleaf. Our Geami dispenser produces an all-round paper packaging solution that gives you a realistic green option. The Geami WrapPak system can be used for protective wrapping, cushioning or block and brace void fill, as it creates an extraordinarily strong but flexible kind of protective packaging. 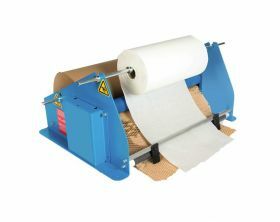 This dispenser is to be used in conjunction with our Geami paper rolls and our white tissue or black interleaf tissue paper. 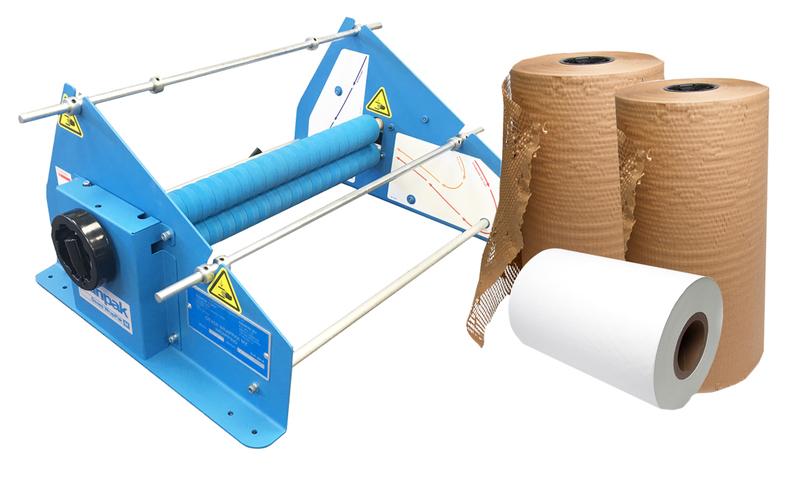 You will need two rolls of paper (250m, expanding to 420m) to one roll of the tissue paper (840m long). measures 660mm wide x 315mm depth and is 490mm high. It has paper holders for a Kraft white or brown paper roll, horizontally die-cut into thousands of slits, and a roll of black or white tissue paper (the paper is sold separately). You create your packaging as and when you need it, simply by pulling the two papers through the Geami machine which then expands the Kraft paper into an attractive 3-D honeycombed cell structure while simultaneously dispensing a smooth layer of tissue. Because the packing paper is so strong, the honeycomb wrap is remarkably shock-absorbent. It is able to cushion your packages from hard knocks and drops, and keep contents of parcels in place. Yet it is also malleable, so you can easily tear off as much as required and mould it around items. The tissue interleaf protects goods from scratches. You don’t need scissors or packing tape as you can secure the wrapping by intertwining the angled cells together. The Geami eco packaging dispenser and papers offer a clean, fresh and environmentally responsible packing solution that combines efficiency with pleasing presentation.